Manufactured from a composite Kevlar/Zytal material which offers performance advantages including, strength, weight, wear resistance and greater holding power. The K Cam range is suitable for lines from 6 to 14mm and have optional extras which includel wire, pillar, top fairleads and angle mounts. Holding power up to 260Kg. Manufactured from marve grade aluminium and spectro grey anodised for high UV stability and durability. Sheaves are precision turned from solid "Ertalyte" bar with a profile that is kind to modern ropes. 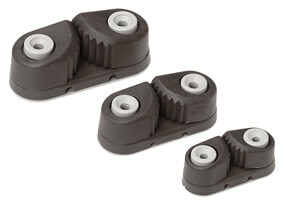 Through bolt mounting gives added strength and allows the units to be stacked. 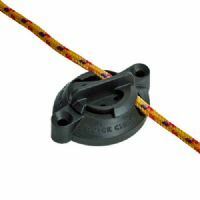 Foot Blocks with Cams are designed to hold the load on the Foot Block allowing the winch to be used for another application. 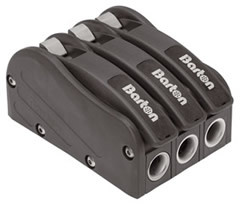 Designed for cruising and racing yachts with holding power of up to 550Kg. Suitable for lines 8 to 12mm. 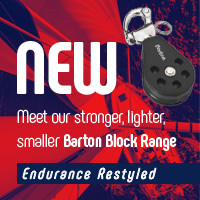 Using the latest lightweight material enables fantastic performance, at minimal weight and bolt together construction allow for easy servicing. Removable inserts on the top face of the handle allows the clutch to be clearly marked for which line it is holding. Available in foursizes to suit 20mm, 25mm and 32mm "T" Tracks. 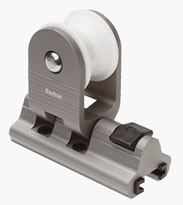 Sheaves are turned from Ertalyte to give friction free performance with excellent UV resistance. 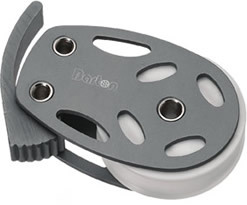 25mm and 32mm Cars feature a nylon insert to ensure free smooth running under load and to prevent damage to finish. Also available are towable options allowing a control line to be lead back to the cockpit.